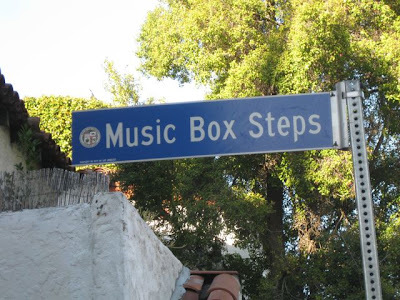 The Music Box Steps is a set of outdoor stairs in the Silverlake district of Los Angeles. 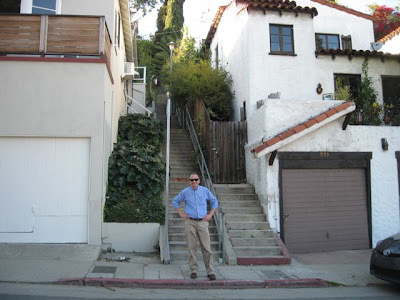 The stairs were made famous by the Laurel and Hardy 1932 short film "The Music Box" in which the comic duo attemped to haul a piano up the impossibly long flight of stairs. I was back in Los Angeles this time last year and in the area (here's a link to Part I from last week). I had heard about these stairs, but had never seen them. Pretty cool. 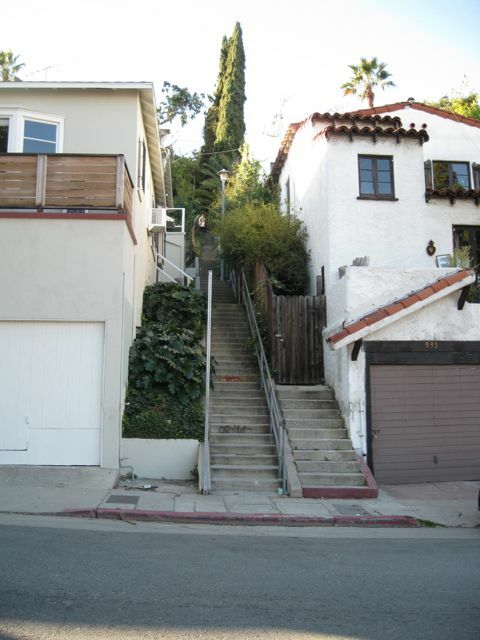 The stairs are located at 936 N. Vendome Street. 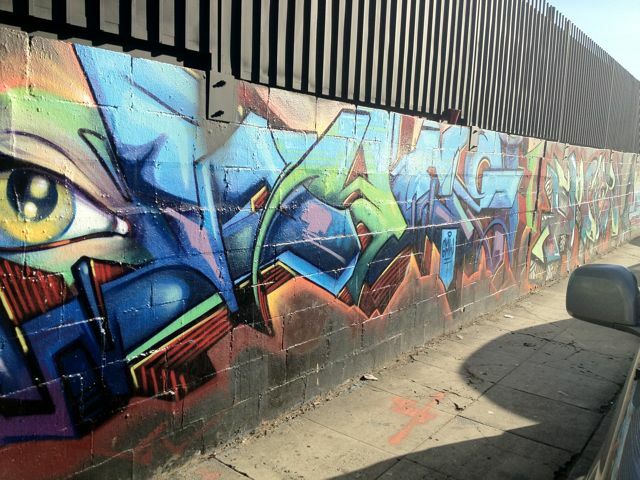 - three blocks off of Sunset Blvd. 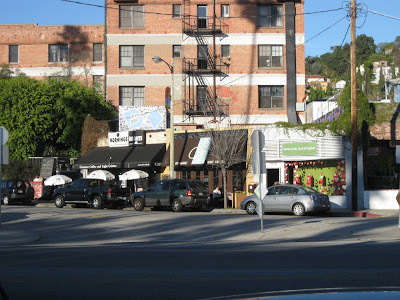 (which is the main drag though Silverlake). There are homes up and down the stairs. I honestly don't how these folks get in and out of their places - do they have to haul everything in and out by hand? 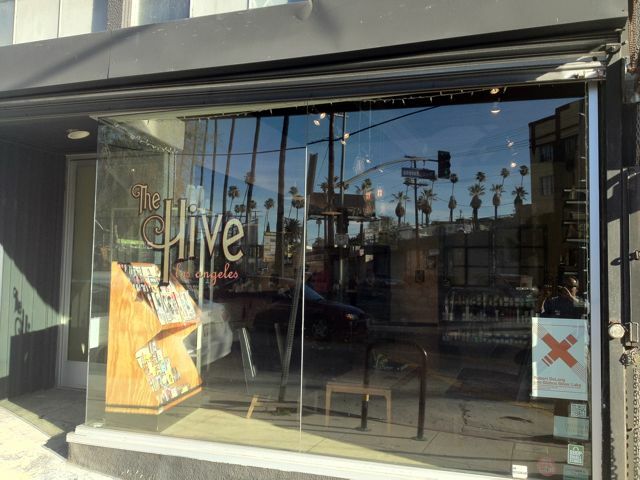 A grocery run could be tricky, let alone moving your furniture in and out. 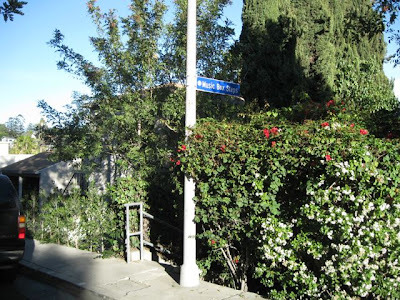 Perhaps someone more famililar with this neighborhood could leave a comment. 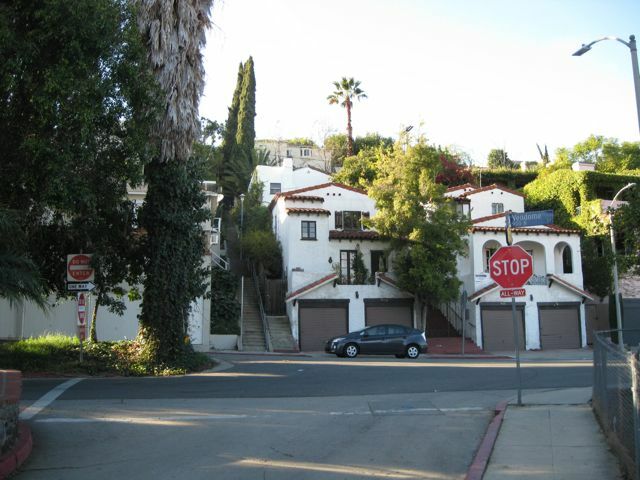 Lots of vegetation - think that's what's part of the appeal. 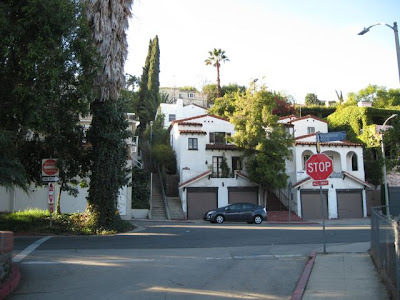 Hard to believe I was in the middle of the second largest city in the U.S.
At the top: 3281 Descanco Drive. Turned around and headed back down. The steps were a nice workout. Apparenty, there are dozens of historic outdoor stair cases all around the Silverlake district. More on that in a bit. A view from the bottom. Across the street (and to my left) is a small neighborhood park appropirately named "Laurel and Hardy Park." Nice. 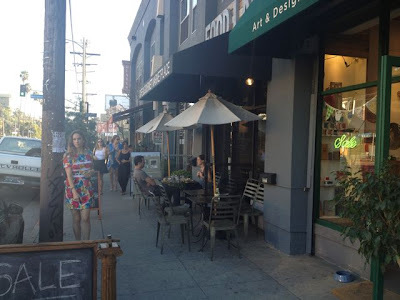 As I commented in the previous post, Silverlake is a neighborhood in transition - with a huge influx of urban (and primarly Anglo) hipsters moving into a working class Hispanic neighborhood. 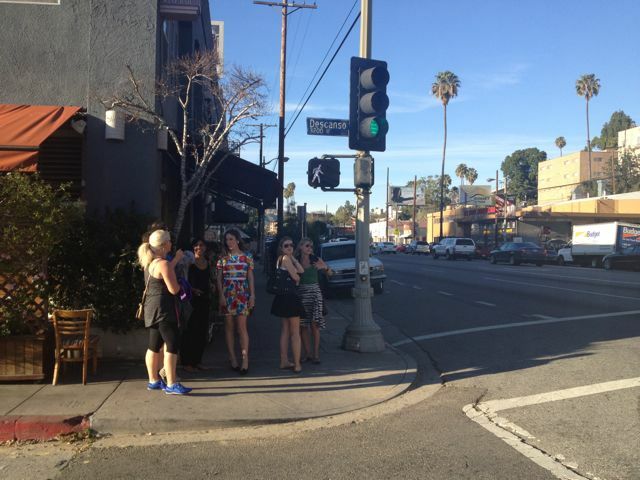 As I walked back along Sunset Blvd, I wanted to asked these women "excuse me, are you hipster?" I actually think they were from out of the area, just visiting. Don't worry - I kept my mouth shut. Urban outdoor cafes and dining = very hipster. Next to Spanish language billboards for McDonalds = not very hipster, for at least a couple of different reasons. Cool, mosaic trash can cover = very hipster. 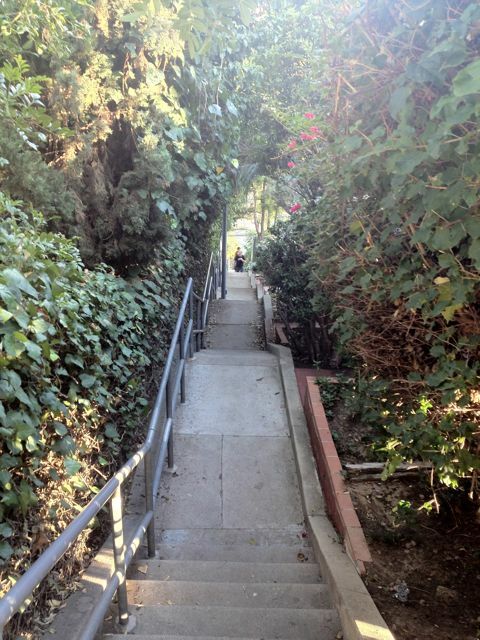 Another set of stairs - this one much shorter. First, a 2008 Los Angeles Times article featuring local resident Dan Koeppel's amazing 16.2 mile hike up 52 (!) 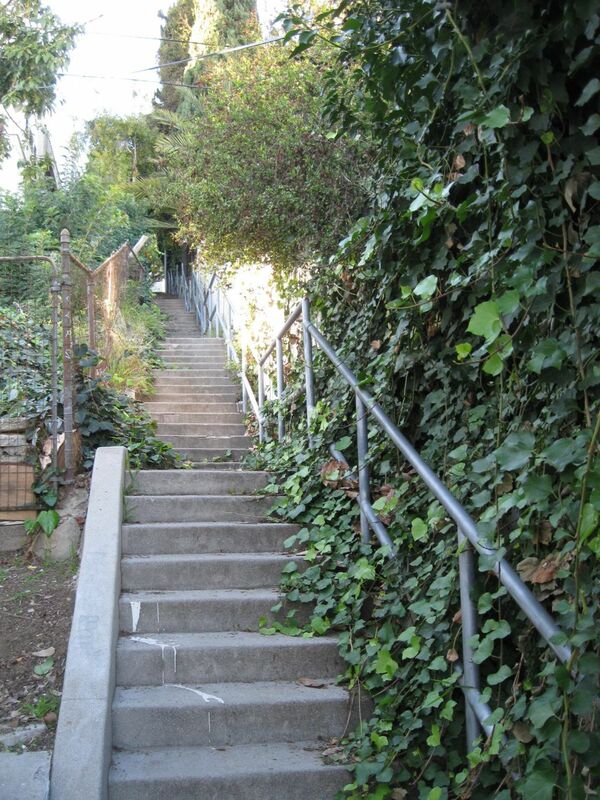 different outdoor stairways - for a total of 4,182 steps - with a 7,445 foot elevation gain. Wow! And second, "Los Angeles: Climbing the Hidden Staircases" an informative blog dedicated entirely to L.A. staircase walks. Back along Sunset Blvd, another Spanish language church. 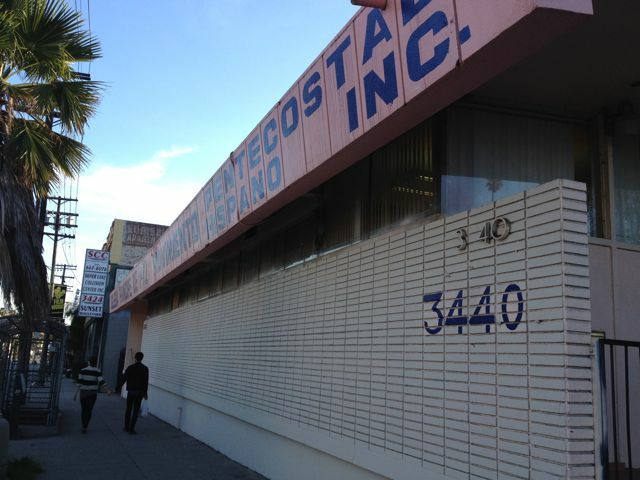 In much of Los Angeles, established English language churches are surrounded by more recent Spanish speaking residents. Looks like reverse is happening here in Silverlake. I'm not at all familiar with this congreation, so I can't comment, but I am familar with an outstanding (English speaking) church less than three miles away that many of my friends in Los Angeles attend: "Reality L.A." - meeting Sundays at Helen Bernstein High School in Hollywoood. 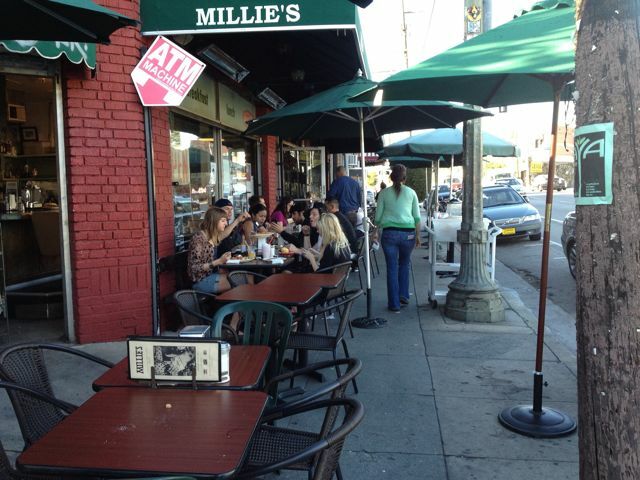 Continuing along Sunset Blvd, another outdoor cafe. 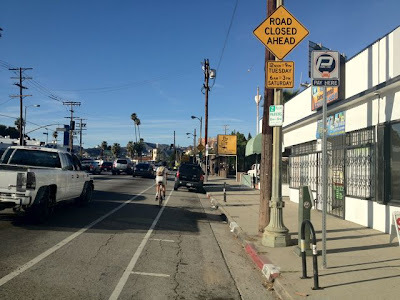 This whole area is remniscent of Abott Kinney Blvd in Venice or Main Street in Santa Monica (both of which I've blogged about on this site). Felt like a page out of Christian Lander's "stuff white people like" blog. 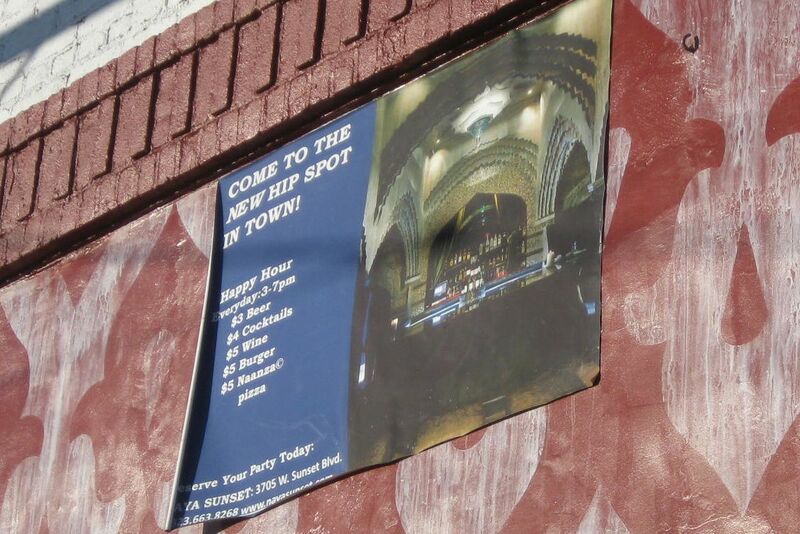 Someone needs to tell this Silverlake restaurant that it's very un-hip to advertise that you are hip. 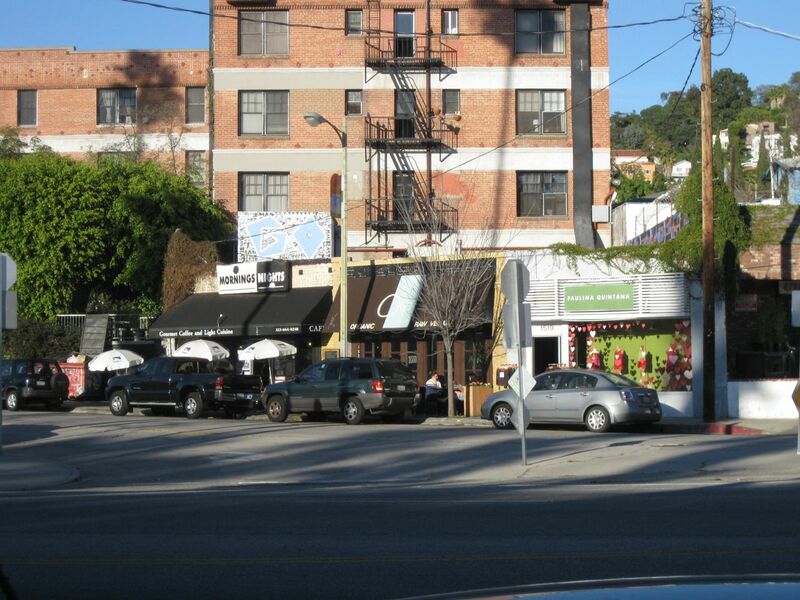 Another view across Sunset Blvd of "Cru" - the original reason I drove over to Silverlake. 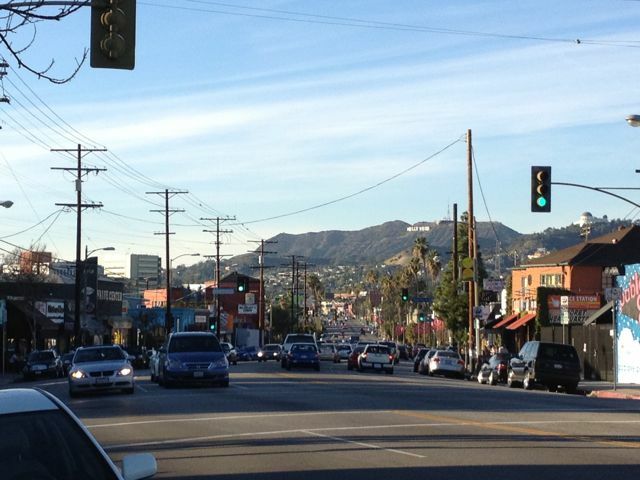 Looking west down Sunset Blvd with a nice view of the Hollywood Sign. 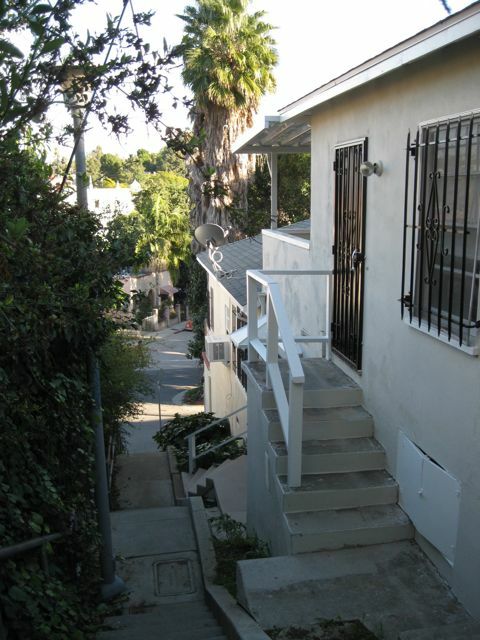 The Silverlake district is located about halfway between downtown Los Angeles and Hollywood. A final wide shot of the same view: Sunset Blvd with the Hollywood Sign in the distance. 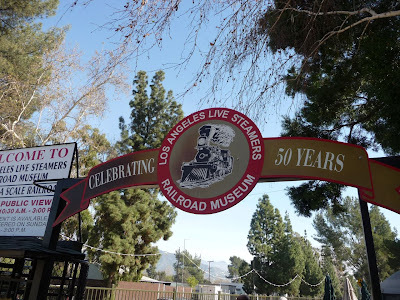 Years ago I remember someone remarking that even after living in Los Angeles for decades, there are still entire communities to be explored for the first time. That was certainly true this time last year when I got out of my car, and walked around a bit in the Silverlake district. I had made a point to have lunch at Cru - both the name of the restaurant, and that name of the organization I work with. Here's a link to what that was like. 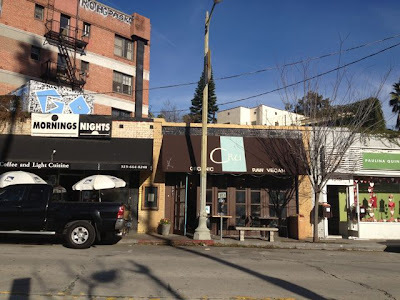 Unfortunately Cru (the restaurant, not the organization) isn't in business anymore, so I'm glad I was able to stop by when I did. 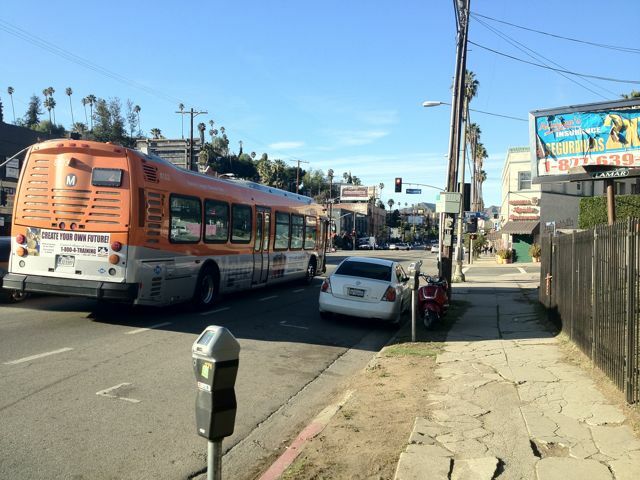 The "main drag" through Silverlake is none other than Sunset Blvd. I've driven along here a couple of times over the years, but never stopped. 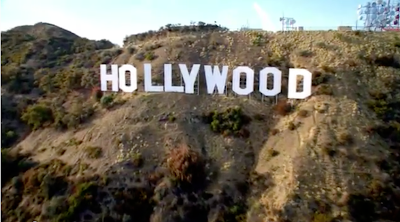 This is all just a few miles west from downtown Los Angeles - and worlds away from the glitz and glamor of where Sunset Blvd. 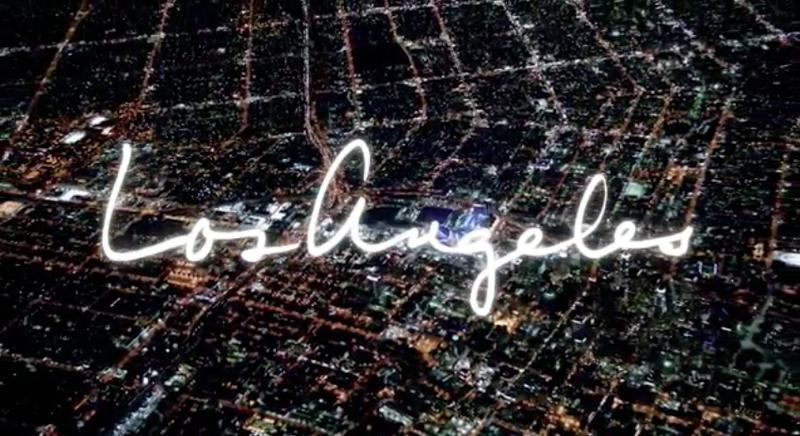 goes through Hollywood, West Hollywood, Beverly Hills and beyond. 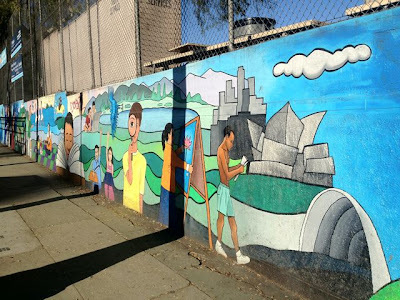 Silverlake is a neighborhood in transition, with a mixture of businesses catering to work-class Mexican-Americans, and the newer urban Anglo "hipsters" who are gentrifying the community. 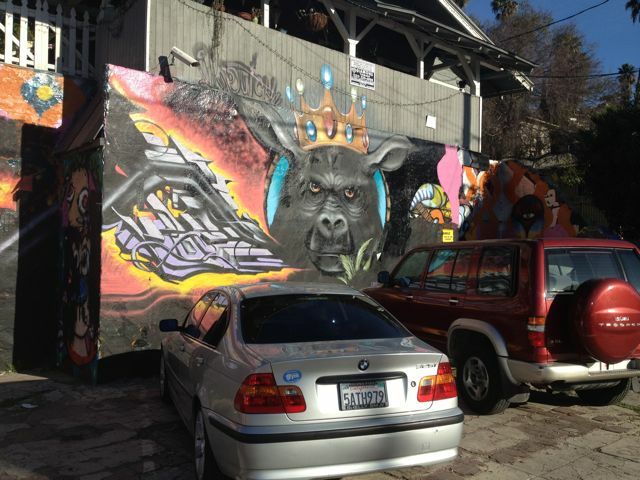 Above, "The Hive" hair salon seems to be focused on the second group. 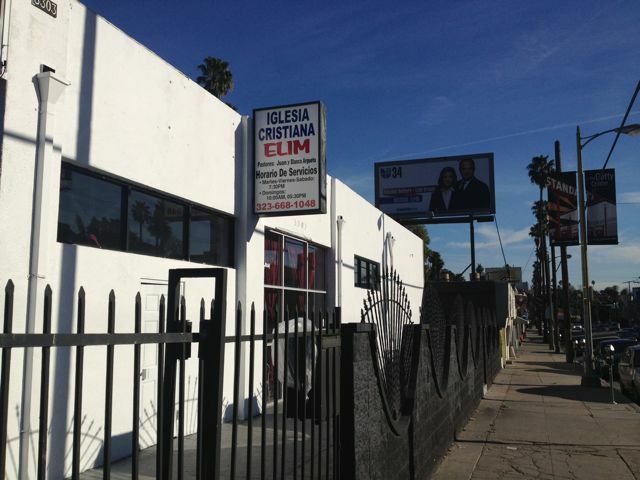 A Spanish speaking evangelical church along Sunset Blvd. Glad they're there. 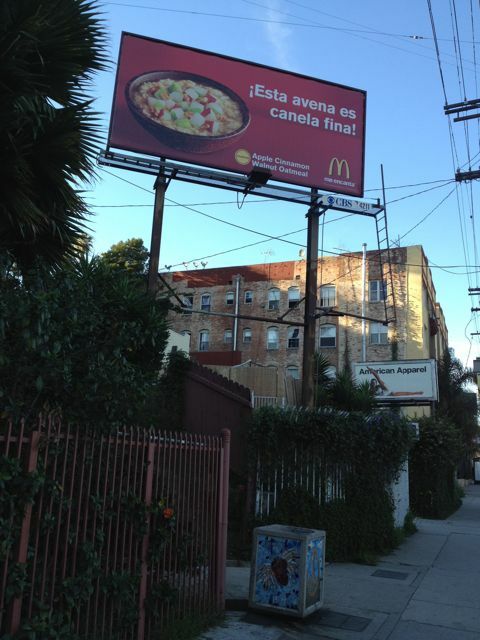 I wonder if they're working to add an "English language service" for the new influx moving back into the neighborhood. If you are looking for an English speaking church in the area, I'd have to recommend "Reality L.A." - located a couple of miles west, in Hollywood. El Siete Mares (The Seven Seas, even I could figure that one out) Mexican Restaurant. 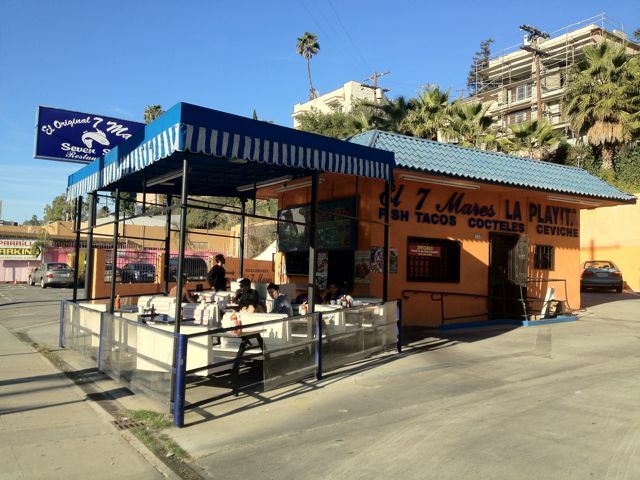 Really looks like something straight out of Baja. If I'm in the neighborhood again, I'd definitely want to stop in. Funky graffiti. I'd like to know the backstory. 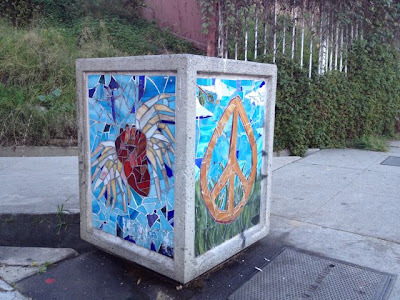 It's stuff like this that makes Silverlake Silverlake. 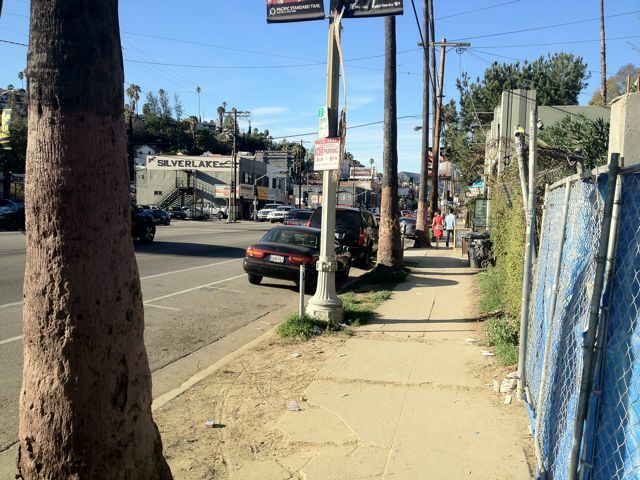 I was surprised, really shocked, at the terrible condition of the sidewalk along this one stretch. Hard to believe this is Sunset Blvd - arguably Los Angeles' most celebrated street. 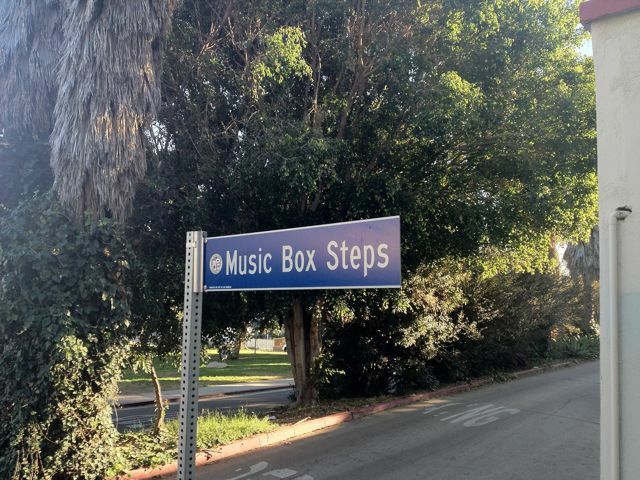 The folks over at Cru had given me direction to the Music Box Steps, less than a mile walk from the restaurant. 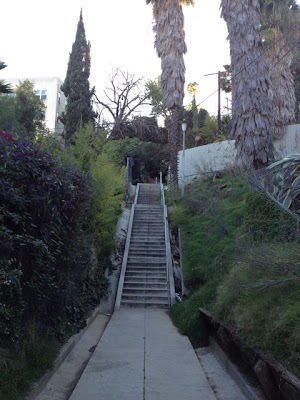 The Music Box Steps are outdoor stairs that Laurel and Hardy famously tried move a piano up in their 1932 film. Above, a neighborhood mural along the way. Another mural, different style. This one featuring Marc Abrams, "The Walking Man," - who sadly died in 2010 at age 58, Abrams was known for his long walks throughout the neighborhood - while reading. A nice tribute, but, for me at least, also a reminder how brief our time on earth really is. "The Music Box" won the first Academy Award for "live action short film" in 1932. 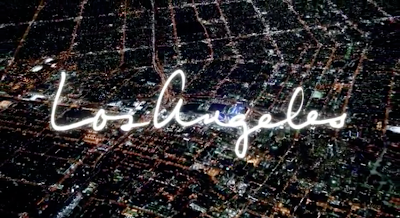 Here's a link if you'd like to watch it. More next week in Part II. 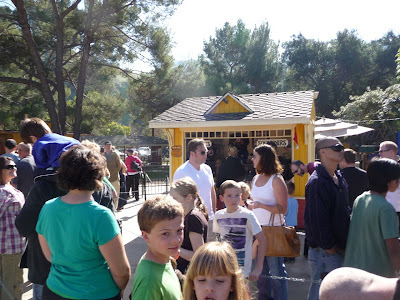 February 2011 my wife, kids and I got a chance to visit the Los Angeles Live Steamers railroad in Griffith Park. 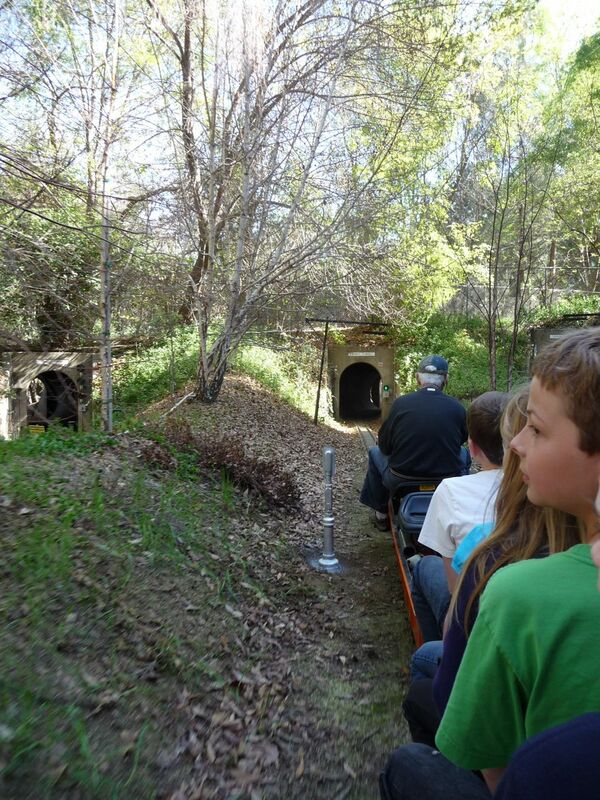 The small, "live steam" trains are open Sunday afternoons. Train rides are just $3 a pop. 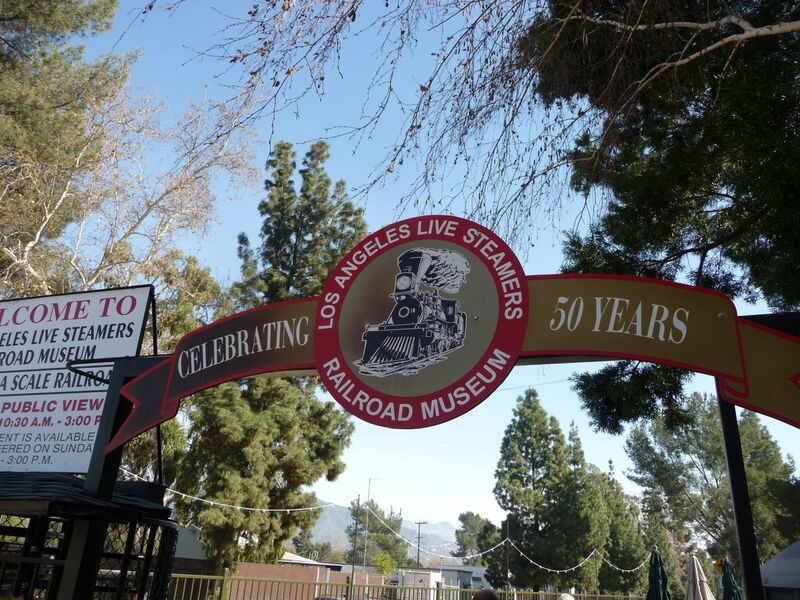 The L.A. Live Steamers is a non-profit volunteer organization of hobbyists, who open up their outdoor train layout to the public on Sundays. In contrast to the elaborate worlds of Disneyland, Universal Studios, and Six Flags Magic Mountain, it's a simple, yet refreshing, diversion. 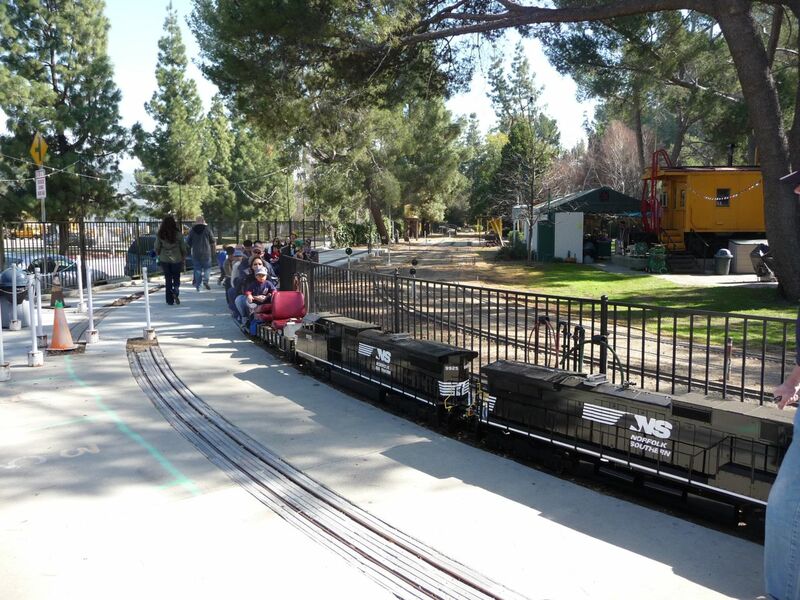 While the layout originally consisted of "live steam" trains, it now includes diesel style locomotives. You sit on them, and they haul you around the track. My kids and their cousins. Our in-laws left a couple of days after this to live semi-permanently overseas. This was part of a larger "good bye" weekend. We hit the California Science Center the day before. Fun - but also sad. I LOVE this picture: my kids and their cousins, along with my wife and me. 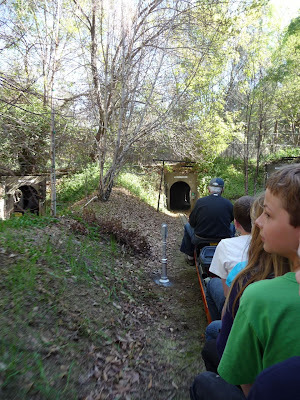 The train got going - and we were off. 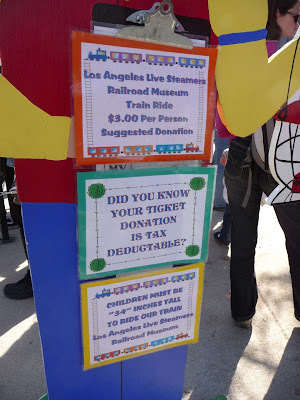 "Live Steam" layouts are NOT unique to Los Angeles. 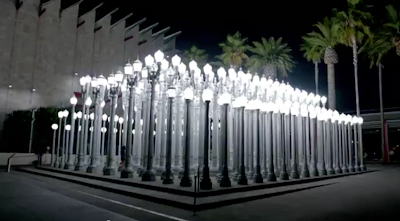 They can be found all over the USA in public parks, and even in some people's backyards. Can you see it? 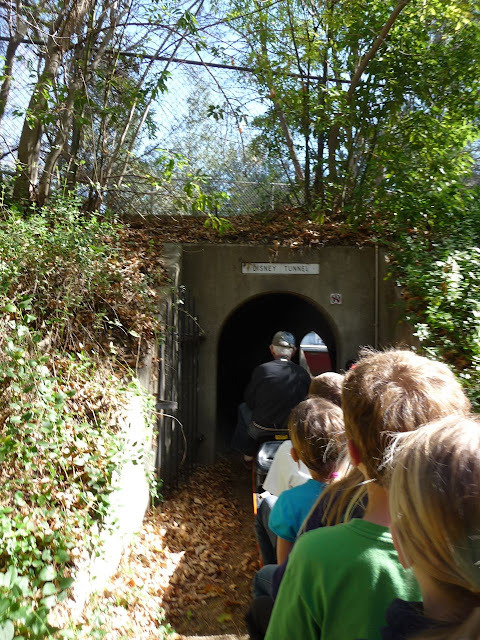 The little white sign says "Disney Tunnel." 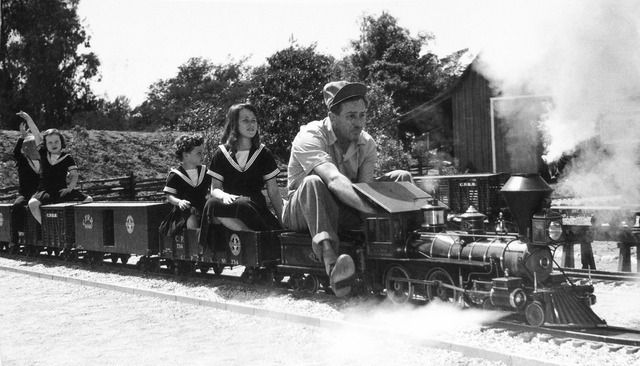 Walt Disney was one of the charter members of the Los Angeles Live Steamers. 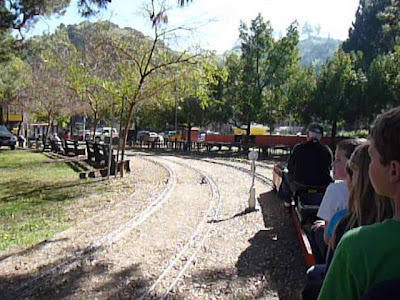 Part of the track we were riding over was originally part of his backyard train layout. 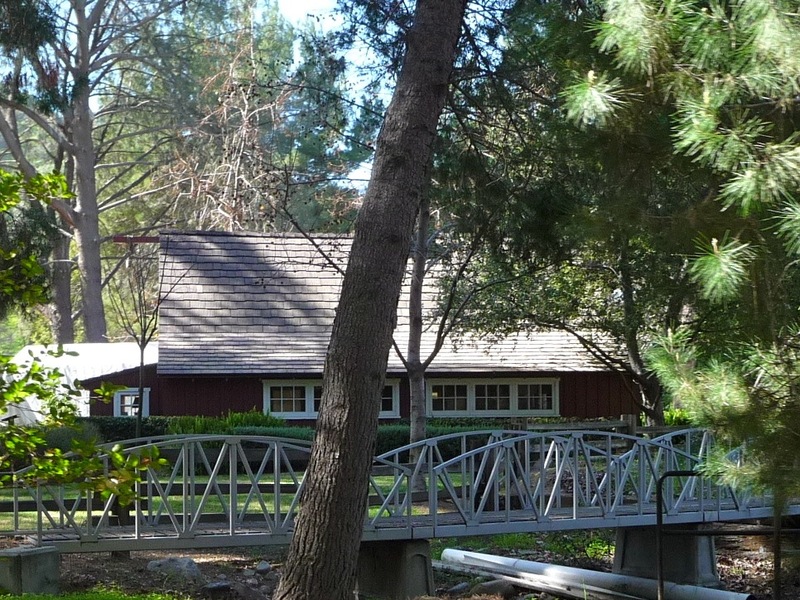 YES, Walt Disney actually had a similar layout in the backyard of his home in Los Angeles. 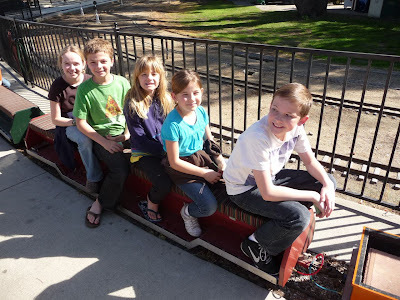 A friend of mine from our church in Los Angeles got a chance to ride on his backyard train as a child. 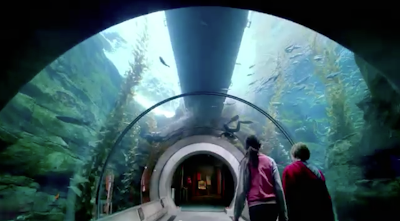 THAT would have been an amazing experience. Here's a link with a layout map and several other photos. 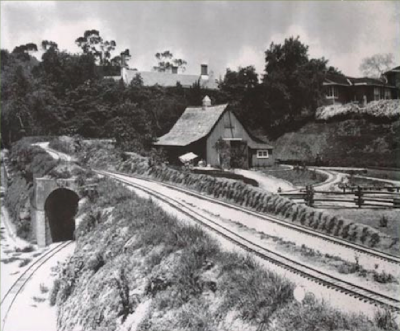 Notice the barn in the center of the photo? Here it is, today. 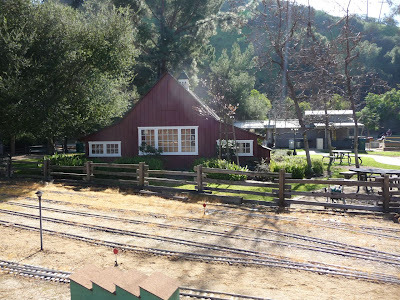 In addition to the track, the Disney family eventually donated the barn that was part of the backyard layout. It was in this workshop that Walt Disney used to tinker with his steam trains . . . and dream of a little project called Disneyland. The barn is open to the public the third Sunday of the month, and we had a chance to visit it a few years before (subject of one of my very first blog posts). Heading back into the station. Good memories. 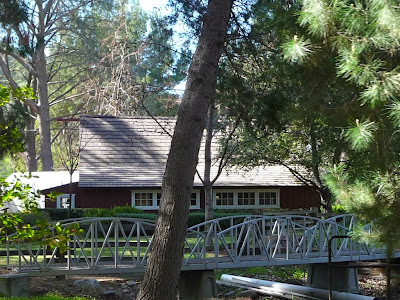 It's worth a visit, especially if you can also see the Walt Disney Barn. Just a few minutes walk is Travel Town. Griffith Park has several other attractions, including the Los Angeles Zoo, The Autry National Center of the American West, and the Griffith Observatory. 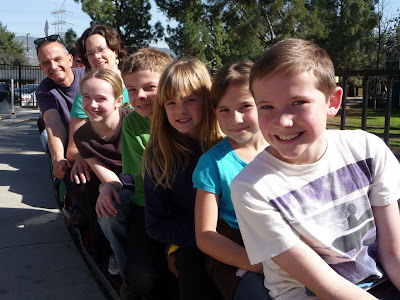 Click on any of these links for thoughts from some previous blog posts. 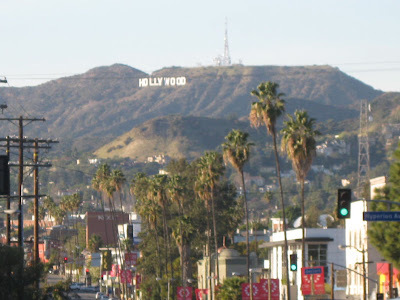 All part of experiencing L.A. Here's a link to the Los Angeles Live Steamers' website. 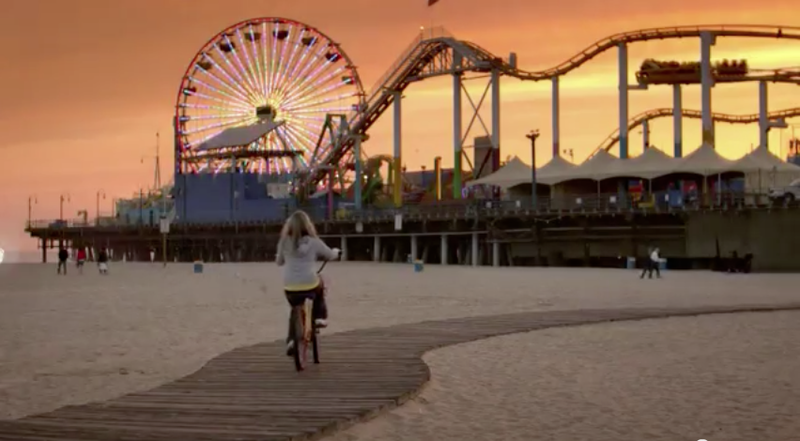 Many thanks to my friend Alex for this great pic, taken a few days ago at the beach in Santa Monica. 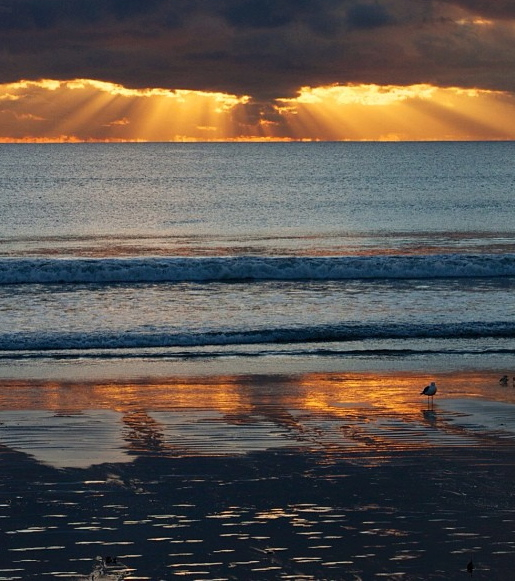 Great composition sun, clouds, and the ocean after a winter rainstorm. Outstanding work. Wishing everyone a Happy 2013 from Experiencing LA.com.